[vc_row][vc_column][vc_column_text]The origins of what some say are now the city of San Antonio occurred on May 1, 1718, with the establishment of a new mission by Franciscan friar Antonio Olivares and Governor Martin de Alarcon at San Pedro Springs near the San Antonio River. Mission San Antonio de Valero would live on in infamy as the Alamo. To commemorate this Tricentennial, an official SA300 Event was held at San Pedro Springs Park on May 1. This celebration featured a reenactment of the founding ceremony of Mission San Antonio de Valero (Alamo) on the site where it was first established 300 years ago. This event was inaugurated by Archbishop Gustavo García-Siller, MSpS, and featured presentations by historians, investigators and officials from universities, archives and historical associations from Mexico, Spain, and Texas. 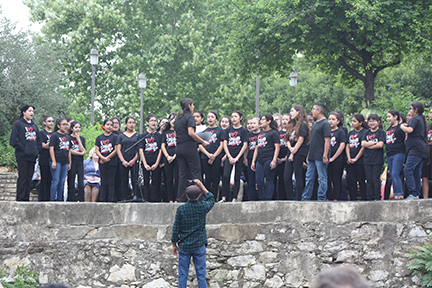 More than 100 students from Losoya Intermediate School participated with the choir, band, and reenactment with Principal Manuel Ornelas and History Department Chair Relvis D. Zeigler. The master of ceremonies for this SA300 Tricentennial event was Jorge Nuñez, Univision 41 news anchor. The gathering was hosted by Thomas Mengler, president of St. Mary’s University; Dr. Felix D. Almaraz Jr., professor emeritus at UTSA; Dan Arellano, SA300 commissioner; Hector Cardenas, president of the Friends of San Pedro Springs Park; and Ornelas. 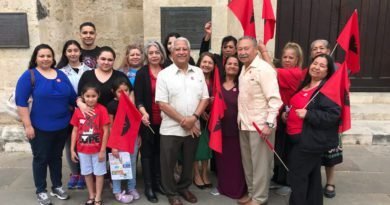 This SA300 event featured a special tribute to Dr. Gilbert R. Cruz and Senator Jesús María Ramón, whose ancestors Diego and Domingo Ramón founded four of the five San Antonio Missions. Others who participated in the ceremony included Ricardo Danel of UNAM San Antonio; Ed Mata, president of Los Bexareños; Miguel Angel Mazarambroz, ambassador of Spain; Karen Thompson of the Daughters of the American Revolution; Martha Fleitas of the Daughters of the Republic of Texas; Gerald E. Poyo, History Department chairman at St. Mary’s University; William A. Cloud, director of the Center for Big Bend Studies; Lucas Martinez, director of the State Archives of Coahuila; and Dr. Sharon Skrobarcek and Edgar Ramón, representing the Ramón family. With these words, inscribed in the Record of Sacraments of the mission, the foundation of San Antonio was documented, exactly today 300 years ago. In that book of records, which goes from 1703 to 1783, before and after this inscription one can read the names of many men and women, a native of this region, who accepted the Catholic faith, received baptism and the other sacraments, and finally passed away in communion with the church. 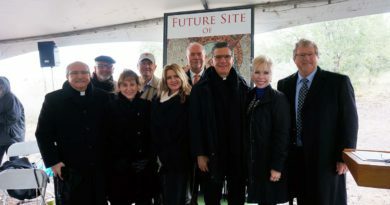 The stones with which San Antonio has been built are living stones; they are souls created by God who has decided to live with the enduring joy that is passed on, and which characterizes our city and our archdiocese. It was apostolic zeal — to announce the good news that the Son of God became man, died on the cross and rose again to take us to God — which moved people like Friar Antonio de San Buenaventura y Olivares, Friar Antonio Margil de Jesús and many others, to establish the Mission of San Antonio and the rest of them, under the protection and with support from political authorities. They were faithful to the missionary mandate to bring the good news to all peoples. Later on, adobe or stone buildings were built for the use of the missions. Some continue to function and others have become ruins or monuments, but the mission is still alive! And the firm rock upon which our community life, our past and our future are founded, is the Word of God, in whom we have placed our trust. It is that Word that allows us not only to live together but to edify each other with an invincible hope, thanks to the diversity of gifts that we have received and which we share. Let us celebrate today, addressing the giver of everything and the owner of our destiny with the words with which the foundation began: In the name of God, Father, Son, and Holy Spirit. We thank you, Lord, from whom everything proceeds, for the strength of the faith, the hope and the love of those men who gave-in to nothing, in order to establish what would become our city and our archdiocese. Thank you for building San Antonio founded on the firm rock of your Son and with the immortal stones of so many faithful souls, who have passed on to us an inheritance of which we are proud. Thank you for giving us a solid, vibrant, happy and inclusive identity, which is joyful for its present. We pray to you, Almighty God, to keep our hope alive and to strengthen our compassionate love for one another so that you will grant us a bright future, worthy of the legacy we have received. Grant us, through the intercession of Our Lady of Guadalupe, Saint Anthony of Padua and all the saints, that we may be a people faithful to the love of God. All this we ask of you through Jesus Christ our Lord. Amen.